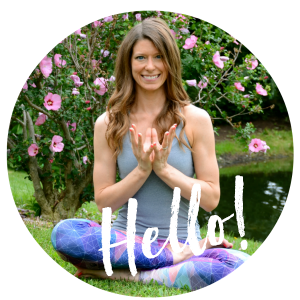 As I was starting my yoga practice in those classes, I began to find poses here and there that really helped me loosen and lengthen muscles that were tight from running. I’d keep a mental tally of my favorites so I could start building a home yoga practice with those poses. I started to regularly practice these poses after my morning runs, and again in the evening if I was feeling particularly tight. These poses were my absolute favorites when I was first starting out, and I think if you’re beginning your yoga journey, you’ll enjoy them too. 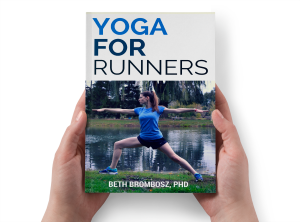 Runners, are you feeling tight and sore? Try these #yoga poses! When I started yoga, Pigeon Pose was my favorite hip opener ever because it’s great for loosening up all of those hip muscles that get tight during runs. Now, having many years’ experience teaching yoga to runners, I recommend that runners start out with Reclined Pigeon and build up to full pigeon. You’ll build flexibility more quickly that way because you’re not forcing your body into a deeper stretch than it’s ready for. Plus, pushing yourself into a deep stretch too soon is a good way to get injured. I absolutely loved (and still do) Lord of the Fishes Pose for stretching out a sore piriformis and other tight hip and glute muscles. I was reasonably flexible when I started my yoga practice, so getting into this pose wasn’t a problem. But, if you’re very tight and it feels uncomfortable to try this one, loosen up first with a Reclined Pigeon or Reclined Cow Face Pose until you’ve built the flexibility to get into Lord of the Fishes Pose. Again, you’ll build flexibility faster if you don’t force your body into poses it’s not ready for. And, you’ll enjoy the process more, too. When I was starting out, Pyramid was my absolute favorite for loosening up my tight hamstrings, a common complaint for runners. I always loved it when my teacher called out this pose in class. But, this is also a pretty big hamstring stretch. If you have very tight hamstrings, I’d start out with a forward fold with bent knees, gradually straightening out your knees as you build flexibility. (Never lock your knees out; there should always be at least a tiny little micro-bend in them.) When you’re ready to try pyramid, begin by keeping your hands on a wall or a chair. Then gradually, bring your hands down to blocks over time, finally working to bring your hands to the floor. Butterfly is great for getting your inner hip muscles stretched out. My hip adductors have always been tight, which actually altered my gait a bit and caused some inner-outer hip imbalances that tugged on my knees a bit. So, I knew I needed to lengthen those adductor muscles. I foam rolled, worked with an amazing massage therapist, and practiced butterfly a lot to help overcome those imbalances so I could stay injury-free. This recovery pose is a must for after long/hard runs, and I practiced it all the time when I was training hard for half and full marathons. It helps blood and waste flow out of the leg muscles so that fresh blood can be brought back in after you finish the pose. In the photo above, I’ve placed a block under my hips to help intensify the effect. You could do the same with a blanket under your hips if you don’t have a yoga block. (Although if you’re a runner, I strongly suggest that you invest in at least one cork yoga block—it will be your yoga BFF.) Hold this one for three to five minutes to get the full effect, then take a minute or two to sit afterward as the blood comes back into your legs. What are your favorite stretches for running? These are great! Thanks, Beth! I know I need to add these in to my post-run stretching. Seeing them on the yoga block helps, because my hips are TIGHT. These are some of my favorite poses, or, the poses that feel the best to do!